Wildfire Preparedness Day is Coming Up: Plan an Event! Project ideas courtesy of the Fire Adapted Communities Learning Network. Look at the “menu” of activities below, and if you can get 5 or more people together for a wildfire preparedness day event, and Fire Adapted New Mexico will contribute to your community’s supply of personal protection equipment (gloves, goggles, dust masks, etc.). Download the full project menu PDF here. National Community Wildfire Preparedness Day (prep day) provides an opportunity to engage individuals in your community in learning about wildfire resilience and mitigation on the first Saturday in May. Prep day is planned across the nation in accordance with the National Wildfire Protection Association. 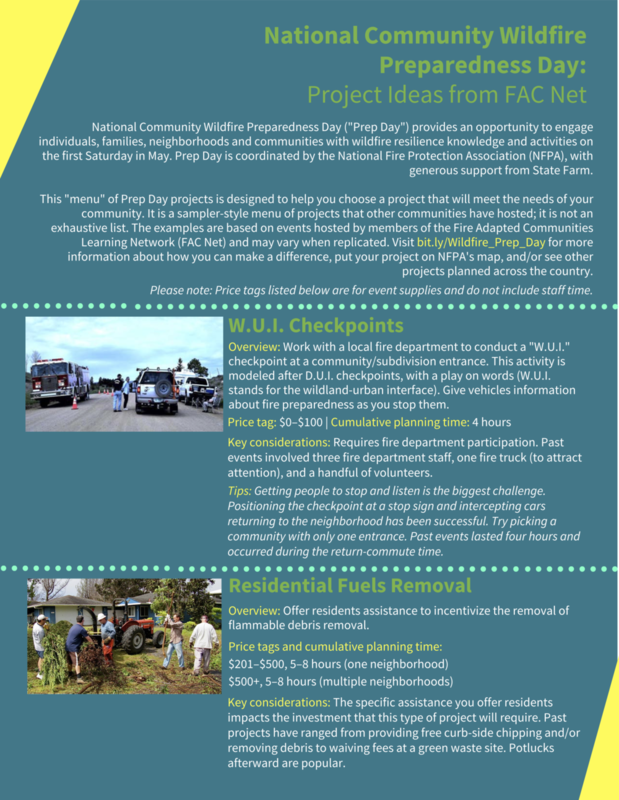 This “menu” of prep day activities is designed to help you choose a project that will meet the needs of your community. This menu was compiled by the Fire Adapted Communities Learning Network. Older PostFire Adapted New Mexico Calendar - Find & post wildfire related events!